With mother, Midnight Gold nursing! Thunder Gold on his Birthday! 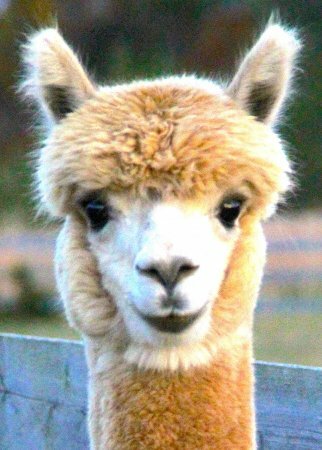 Thunder Gold is the quintessential alpaca with fabulous conformation with fleece that has a very bold crimp that is very fine and bright. 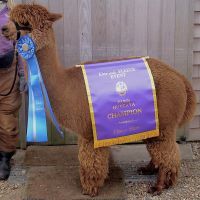 Blue Ribbon winning fleece at the MAPACA Jubilee 2017. "Very Bright!" 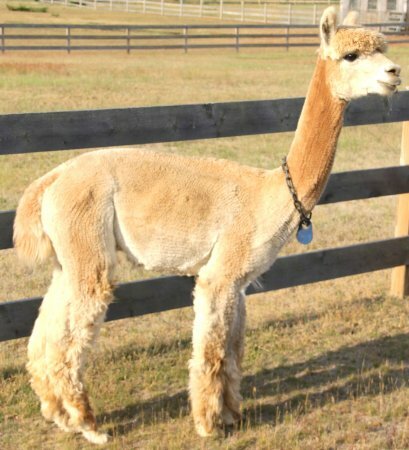 He was also awarded a Blue Ribbon for his fleece in the 2015 A-OK Alpaca Blast Off Show. 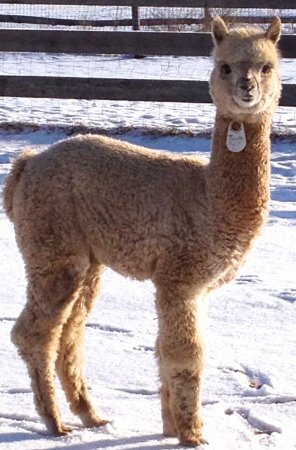 He has amazing genetics with his dam being Snowmass Midnight's Gold. Midnight has produced show-stoppers for us. 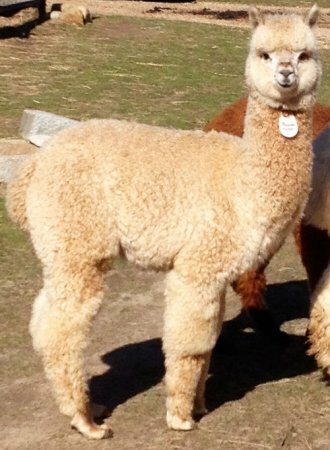 (Her first offspring, Andean Midnight was the highest paid maiden female alpaca in the world at the time, selling for $100,000 at auction). His sire is CT Estrada who has won multiple champions and blues! He is the Grandson of Snowmass Peruvian Avalanche. 2016 MAPACA Jubilee Spin-Off judge Diana Timmerman commented: "Great lustre. An absolute dream to card! Locks open without resistance and lifted VERY cleanly off the carder. Gosh, that lustre is even more pronounced now that it's clean. This one stood out from the others like a shining light! Great all purpose yarn." Fiber Criteria Highlights: Absence of Guard Hair, 5 out of 5. Uniformity of Length, 5 out of 5. Uniformity of Micron, 4 out of 5 possible points. Finished Product Criteria Highlights: 1st Impression, 6 out of 6. Usability, 7 out of 7. Brightness/Luster, 6 out of 6. Handle, 5 out of 6 possible points. 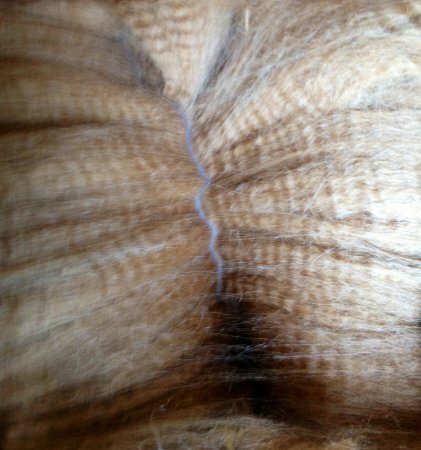 2016 Southern Select Spin-Off judge Judy Keske commented: "Soft - nice crimp and staple definition - adequate length. Light guard hair :) When carding, minimal effort to align - flicks freely :) Nice loft. Nice glow under lamp. " 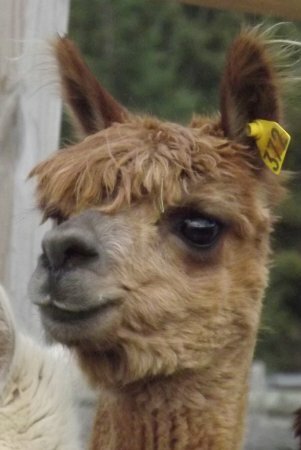 Fleece Score Highlights: Absence of Guard Hair, 4 out of 5. Ease of Carding, 4 out of 5 possible points. 2016 TXOLAN Spin-Off judge Roo Kline commented: "Nice bold crimp and lovely lustre. Debris drops VERY EASILY(!) from locks when teased open. Very easily carded. I've never spun anything like this. It drafted effortlessly and very smoothly by itself with very little guidance. It did depend to be spun thin, but did so beautifully and easily. Wow." 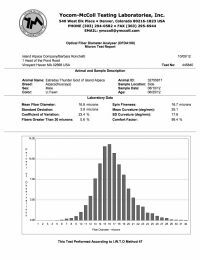 Fiber Criteria Highlights: Uniformity of Length, 4 out of 5 possible points. Spinning Criteria Highlights: Ease of Carding, 4 out of 5. Ease of Drafting, 8 out 8. Ease of Spinning, 10 out of 10 possible points. 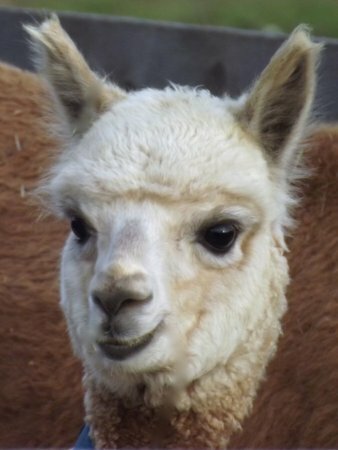 2015 A-OK Blast Off Fleece Show - Judge Sara Jane Maclennan commented: "Lovely fleece! Bright, soft, minimal guard hair. Congrats!" Fleece Score Highlights: Fineness/Handle, 19 out of 20. Micron, 7 out of 8. Length, 7 out of 7. Color, 5 out of 5. Character (Crimp), 8 out of 10. Brightness, 8 out of 10. Absence of Guard Hair, 8 out of 10 possible points. Total Score: 81.5 points!! 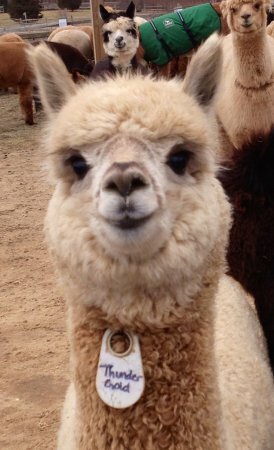 2015 Big E Alpaca Fleece Show judge Stephanie Glyptis commented: "Very consistent in style and micron." Fleece Highlights: Micron, 7 out of 8. Length, 6.5 out of 7. Color, 4.5 out of 5. Character (Crimp), 8 out of 10. Absence of Guard Hair, 8 out of 10 possible points.